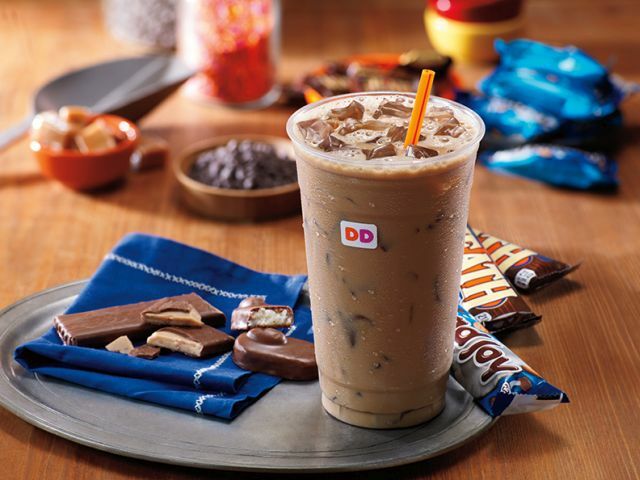 Dunkin' Donuts is set to offer new candy bar-flavored iced coffee to kick off the summer. The new coffee comes in two flavors: Heath and Almond Joy. Almond Joy iced coffee features the taste of milk chocolate, almond, and coconut flavors, while Heath iced coffee features notes of milk chocolate and English toffee. The flavors are available for a limited time starting May 30, 2016 at participating Dunkin' Donuts locations nationwide. In addition to iced coffee, they can also be added to hot coffee, lattes, and macchiatos. The chain is sampling the new coffee flavors this weekend before the official launch at the home of Heath and Almond Joy at Hershey Park in Hershey, PA.
Additionally, fans of Dunkin's Butter Pecan flavor will be pleased to know that they're keeping it around throughout the summer.